The TV program, The Biggest Loser, has become incredibly popular as people work to lose weight and build fitness. But not everyone can be included on the show. People who will never have their face on TV are flocking to a fitness resort in southern Utah that partners with the show. The Biggest Loser Resort At Fitness Ridge has become a phenomenon itself. It is located just outside of St. George, close to Snow Canyon State Park and Tuacahn Amphitheatre. And by the way, the title of the facility is not a cheap ripoff of the hit NBC TV show by the same name. They are in fact one and the same, joined at the hip as it were. Three and a half years ago, NBC singled out the Utah workout spa in the shadow of the red hills to be its official weight-loss farm, the only resort on Earth that could legally call itself The Biggest Loser. Fitness Ridge had a waiting list that ranged from four months to 10 months until NBC finally opened additional The Biggest Loser Resorts, first in Malibu and then at Niagara Falls in New York. A fourth is scheduled to open this summer in Chicago. Now, there’s no waiting list in Ivins but occupancy remains high, with many weeks still sold out. The Utah Office of Tourism has launched its spring/summer advertising campaign, which encourages people to visit the five southern Utah national parks. The campaign features TV commercials that will air in Los Angeles, Denver, Phoenix, Portland, San Francisco and Seattle along, along with outdoor “wallscapes” on buildings. It will also include social media activities. You can see the TV commercial here. "Everybody knows Utah has the greatest snow on earth," said Vicki Varela, managing director of the Utah Office of Tourism. "Now we're putting out the story far and wide that we also have the greatest parks on earth." Varela said advertising the parks after the federal government budget cuts known as sequestration will help would-be tourists understand "our parks are wide open for business." About the sequestration, Denis Davis, the Utah state coordinator for the National Park Service, said: "The impact is real, but most of the impacts won't be noticed by our visitors. And that's fortunate... I think the more typical things that people will see is that restrooms won't be as clean. There won't be as many ranger-guided programs and activities. And there won't be the same level of law enforcement activity." The TV commercial features Robb Baumann and his family hiking, rafting and biking through each of the five parks. Baumann, who first lived in Utah as a college student, recently returned because he missed the outdoor activities. Google has just launched a service that makes it easier to use public transportation to get around the Salt Lake metro area (which extends from Ogden down past Provo). The service not only suggests routes and identifies stops, it also shows real-time information on schedules and delays. Google has launched the new service in New York City, Washington, D.C., and the Salt Lake area. It is a slick service that should help residents and tourists alike. I tested it today and I'm impressed. Go to maps.google.com and click on Get Directions. Type in your starting address and your destination address and click the “get directions” button. A map will load showing the recommended route using public transportation. If options are available, they will also be shown. Click on one of the marked stops and a window will open showing information about that stop. The service defaults to “leave now” but also allows you to choose a later departure time. If you choose a later time, the service will show when you need to be at the stop, along with information about any delays along the route. Google has long put information about bus routes and stops on its maps. This new service is an expansion, adding real-time schedule and delay information. The Utah Transit Authority has been aggressive about using technology to make public transportation more convenient and usable. Apparently, the Salt Lake area was chosen for the service because schedule information was already available digitally and could be easily incorporated into the system. The Salt Lake Tribune has this article with more information about the service. The water is starting to warm at Lake Powell and so boating activity is picking up. The water is still too cold for skiing or other water sports but this is an ideal time to explore the lake and enjoy the scenery, in relative solitude. People do ski and wakeboard at the lake during spring but most wear wet or dry suites. It will be late My or June before most people are comfortable spending much time in the water wearing just swim suites. Memorial Day Weekend kicks off the tourist season. On that weekend the major marinas will be zoos, with heavy traffic on the launch ramps, in the nearby bays and the lake's channel. If you plan to boat at that time you should launch early and get away from the marinas as quickly as possible. Fishing is picking up right now. Action for striped bass, smallmouth bass and largemouth bass will become good in early April and will be red hot in May. Quagga mussel larva have been found at various spots around the lake and they are a big concern to water managers. Boats that operate at the lake need to be inspected, cleaned and dried. Utah's Division of Wildlife Resources provided this news release about the mussels. Individuals who boat at Lake Powell often travel to other Utah water bodies. Boaters need to be exceptionally careful in decontaminating their boats after they visit the lake. tanks/livewells. Lake Powell’s water is now a serious threat to other Utah waterbodies. Removing this water greatly reduces the threat. 3. Wipe down the outside of your boat. Powell cannot survive without water for seven days in the summer. water, there might be a long wait before you can decontaminate and launch. Canyonlands National Park reports that the Shafer Trail is now open for vehicle travel – another sign that spring is here and the parks are launching their seasonal activities. The trail is shown at right. It consists of a series of switchbacks that fall off Island In the Sky Mesa near Dead Horse Point, down to the White Rum Trail. It is an extremely scenic route that can be driven in a high clearance vehicle. Four-wheel drive is not usually needed. SALT LAKE CITY, UTAH (March 18, 2013) - Renowned cyclocross and enduro racer Ali Goulet has teamed up with Salt Lake City-based event marketing agency Mountain Sports International to create the new Enduro Cup series. Enduro is the most progressive form of mountain bike racing which is hugely popular in Europe and gaining incredible interest in the United States. Inspired by rally car and motorbike enduro racing, enduro mountain bike racing is an all mountain stage race where riders compete to gain the lowest cumulative time from several downhill sections of the course. Inspired by the great enthusiasm spurred by the 2012 Bell Wasatch Enduro at Canyons Resort in Park City, the new Enduro Cup provides more opportunities for racers to compete in the state. The first event of the 2013 Enduro Cup will be held in Moab, UT at the Magnificent 7 trail area. Registration for the Enduro Cup in Moab is open now on http://endurocup.athlete360.com. Participation cost is $80 for adults and juniors. Snow Canon State Park, located near St. George, is delightful right now, with mild spring temperatures. This is the perfect time to hike, bike and explore the park and surrounding area. Travelers need to know that road construction will sometimes delay traffic coming to the park's south entrance through April. The road will be open through the period but delays are likely. People are advised to use the park's north entrance. This stgeorgeutah.com article has details. Below are excerpts. “And with the Ironman St. George route being changed to include this section of roadway, the city (recognized) the priority of the reconstruction plans,” city Engineer Chuck Gillette said. The project timeline puts completion at the end of April, though it may be finished sooner. The road and adjacent walking trail will remain open during the project, but park visitors should expect delays and hazardous driving conditions and are encouraged to use the park’s north entrance as a better alternative. Snow Canyon is one of our most popular state parks. Many activities are offered during the spring, including ranger-led hikes into Johnson Canyon and Paradise Canyon. See park event information. Requires a 2012-2013 season pass(with photo) & photo ID from any ski area around the world! Luxury-Hotels.com has just released a survey showing the most expensive ski hotels in the world. Our own St. Regis Deer Valley is ranked as the most expensive in the US, and the 3rd most expensive in the world. Montage Deer Valley comes in at #12 world-wide. The Top 20 are shown below. See the full report. The creative numbering comes right from the survey report. I just print em as I see em. It is interesting that Stein Eriksen Lodge is not on the expensive list, but it ranks as Utah's best (only 5-Star) lodging property in many surveys. I'm glad there is a wide variety of Park City lodging options, including many that are quite affordable. The Great Salt Lake is a popular attractions for locals and tourists alike and Antelope Island is the most popular destination on the lake. It is a great place to walk on the beach, swim in the famously salty water (in summer), hike, bike, observe wildlife and camp. Antelope Island State Park holds guided adventure treks on a regular basis to help people safely enjoy the island and surrounding lake. Coming up is a guided kayak tour of Egg Island, where thousands of birds nest and rest. The tour will be a bird watcher's dream and will provide a great opportunity to see a unique part of the lake. Location: Antelope Island State Park. Birds of prey have many specific and unique adaptations that translate into powerful and efficient hunters. Come meet two birds of prey and discover what makes them so unique and intriguing. Program begins at 4 pm in the visitor center. Entrance fees apply. For more information call (801) 721-9569. Bird Tour: Wear Green, Celebrate Spring! Location: Antelope Island State Park. Join us at 9 am at the visitor center to celebrate the coming of spring as we look for and learn about some of the many birds living here. At 10 am we will caravan down to the ranch (weather permitting) which is a wonderful bird oasis. Dress to spend time outside. Entrance fees apply. For more information call (801) 721-9569. Location: Antelope Island State Park. Experience the sounds and sights of a ground nesting colony of Great Blue Herons, Double-crested Cormorants and California Gulls. This tour will provide a unique opportunity to see birds nesting on the Great Salt Lake and experience the beauty and solitude of the Great Salt Lake from a kayak/canoe. Meet at 8:45 am at the Antelope Island Marina for a 9:00 am to 12:00 pm guided tour. Space is limited (10) and registration is required. For more information call Wendy at (801) 721-9569. Entrance fees apply. Location: Antelope Island State Park. Experience the sounds and sights of a ground nesting colony of Great Blue Herons, Double-crested Cormorants and California Gulls. This tour will provide a unique opportunity to see birds nesting on the Great Salt Lake and experience the beauty and solitude of the Great Salt Lake from a kayak/canoe. Meet at 4:45 pm at the Antelope Island Marina for a 5:00 pm to dark guided tour. Space is limited (10) and registration is required. For more information call Wendy at (801) 721-9569. Entrance fees apply. Location: Antelope Island State Park. The story of how, when and why Great Salt formed is rich in geologic history – and that story continues today. Join the Park Naturalist at 3:00 pm for a 5 ½ mile round-trip hike along the Shoreline Trail as we discuss the intriguing past of this ancient lake. The Shoreline Trail starts near campsite #8 in Bridger Bay Campground. Entrance fees apply. For more information call (801) 721-9569. Some desert areas in Utah look like the could be from another planet and, indeed, our terrain has stood in for alien landscape in many moves – from the Planet Vulcan to John Carter's Mars to the Planet of the Apes. Some areas have also been used in scientific research exploring what it might be light to colonize other planets. An ongoing project has volunteers living in a simulated Mars colony in the desert outside of Hanksville, near Lake Powell in southern Utah. The simulation has made news and been featured in this blog before and probably will be again. We're drawing your attention to in now because they have released a bunch of striking photos showing activity as the crew lives in the “space colony” and explores the nearby alien terrain. Many newspapers and magazines are publishing articles that include the photos. The UK's Daily Mail has this article, which includes more photos than any other I perused. The photos are worth viewing. Below are excerpts from the article. The comments at the end of the article are also worth reading. All outdoor exploration is done wearing simulated spacesuits and carrying air supply packs and crews live together in a small communication base with carefully rationed essentials - everything needed to survive must be produced, fixed and replaced on-site. Each crew spends between two weeks and a month living in a habitat unit, performing the kind of work astronauts will be expected to carry out on Mars, such as collecting rock samples from the surface and examining them back in the habitat, conducting life science experiments and studying the local geology and geomorphology. 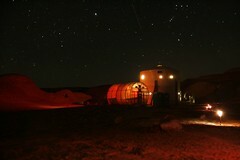 The Utah site is one of two operated by the Mars Society as part of its Mars Analog Research Station (MARS) project. The other site is located in the Canadian Arctic, with two more planned for the Australian outback and Iceland. These locations were chosen because some environmental conditions, geologic features or biological attributes may be similar to those thought to be encountered on Mars. Spring is a wonderful time to explore Utah's state parks. All of the parks hold special events and learning activities to help engage the public. Many of the activities are designed for families and children. We thought these two activities merited special mention. Wasatch Mountain has a photo contest currently underway; you can see details here. Prizes will be announced on the park's Facebook page and Website. Entry deadline for the current contest is April 15. Check out RideOn! Youth Ambassador Jessica Rhodes' video on how to enter (shown below). She's a two-time cash prize winner! Grab your riding gear, your friends and your camera, and create your own off-highway vehicle safety video. You, your teacher, and your school could each win up to $900 in cash and gift certificates! *No taxpayer money is used for prizes. Utah State Parks and Recreation, Utah School and Institutional Trust Lands Administration (SITLA), and the Larry H. Miller Group co-sponsor the RIDE ON! Video Contest. National Geographic Adventure is out with this list of up and coming ski towns, and Ogden, Utah, tops the list. The magazine concludes Ogden's resorts have quality skiing comparable with other, more famous, Utah resorts, without the crowds. These are the local’s favorites, the up-and-comers. They’re real towns, often cheaper and friendlier than the big dogs—at least for now. If you’re on the hunt for great skiing without the crowds and glitz, read on. Snowbasin underwent major renovation for the 2002 Winter Olympics and features elegant base lodges with state-of-the-art lifts, including a tram and two gondolas. Powder Mountain is a throwback hill, with very non-high-speed chairlifts, simple lodges, and cheaper lift tickets. The article gives tips on best runs along with info on where to stay and eat, and what to do off the slopes. The article overlooked Great Basin National Park, which is virtually on the Utah/Nevada border. It's a good article. We're pleased that the world sees Salt Lake as a maturing, multicultural destination with much to offer. A section of US Highway 89 that buckled and collapsed about 25 miles south of Page, Arizona, remains closed to traffic in both directions and officials now say it may be months before the road is repaired and reopened. Hwy 89 is a major north/south artery running through Utah and northern Arizona. It is the primary highway providing access to the Wahweap area on Lake Powell. If you are coming to the lake from Utah there is no problem because the road damage is south of the lake. If you are trying to reach the lake from the south, you will need to detour around the damage and that will add about 45 minutes to your drive time. If you are not heading to the lake but just need to travel 89 north or south, you will need to use Hwy 89A (over Lees Ferry and the Kaibab). In the early morning hours of Feb. 20, an apparent landslide ripped through a section of US 89 along a mountain slope about 25 miles south of Page, buckling more than 150 feet of the roadway and tearing the pavement up in six-foot-high sections. The significant roadway damage forced the Arizona Department of Transportation to immediately close a 23-mile stretch of the highway (mileposts 523-546) between the US 89A junction near Bitter Springs to the State Route 98 junction. Don't cancel any Lake Powell plans. Just avoid the damaged roadway. Ok, Bryce Canyon still has snow, cold and winter conditions but spring activities are starting at other Utah national parks. It’s 73 degrees, birds are singing, and tomorrow the South Campground & the Zion Human History Museum open for the season! Must be spring! From now until March 23, you can drive and park in Zion Canyon. From March 24, 2013 through October 27, access to the canyon will be by park shuttle only (except for guests staying at Zion Lodge). The Zion Canyon area is located at a low elevation where spring comes early. Elevations are higher in other parts of the park and many areas are still closed by snowpack. At Arches National Park, ranger-led Fiery Furnace hikes begin on March 2. The three-hour, ranger-led tour is a real adventure! We have video of the hike – see it here. Other ranger-led events will begin during the next several weeks. All trails in Arches are open but some have ice right now. That will change quickly as temperatures warm during the next couple weeks. Similar conditions exist in Canyonlands and Capitol Reef national parks. Areas that get sunshine are dry and in excellent condition. Shady spots may have ice right now. Today I explored canyons in the Moab area and saw considerable snow on north slopes, but had no trouble driving and hiking. It is apparent that snow and ice is melting fast, with tiny streamlets trickling down adjacent hillsides. Snow and ice patches are visibly smaller from day to day and will soon be completely gone. March is a great time to explore and hike in these areas.